Coffee is the most popular drink all over the world. There are almost no people who can resist having a cup of coffee in the morning. Some can’t imagine starting the day without this delicious drink able to provide you with the necessary energy for the whole day. 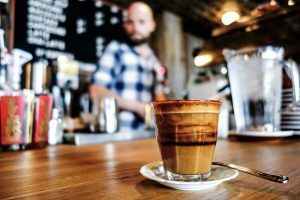 There are a lot of interesting non-standard ways to make coffee, which you will be able to discover here. 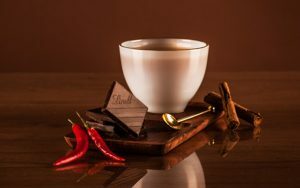 Italians drink coffee with sugar, Mexicans with cinnamon, Germans and Swiss with hot chocolate, Belgians prefer it with chocolate. Ethiopians add salt to coffee and Moroccans like coffee with pepper. In the Middle East, coffee is drunk with cardamom or other spices. 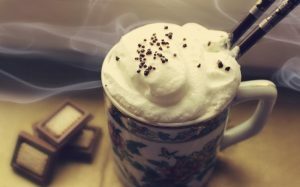 Coffee with whipped cream is the favorite drink of Austrians. The Egyptians prefer “pure” strong coffee, adding sugar, milk, cream, cardamom, if desired. 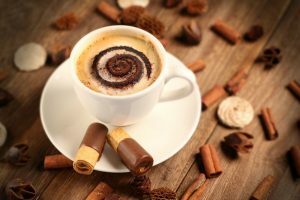 Here you will find the best collection of unique coffee recipes for gourmets, one of which will definitely become your favorite one. 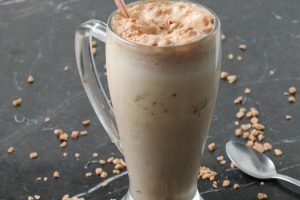 Preparation: Two glasses of cold milk are mixed with a spoonful of ground cinnamon, a pinch of nutmeg, 2 tablespoons of cane sugar and 2 tablespoons of the baked in the oven and blended with a blender pumpkin. Preheat the mixture on a low heat, but do not bring to a boil. Add a little vanilla and two cups of freshly brewed espresso. 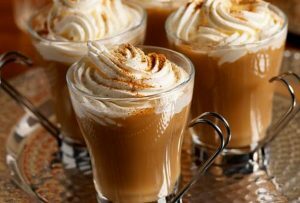 Before serving, the drink can be decorated with whipped cream. 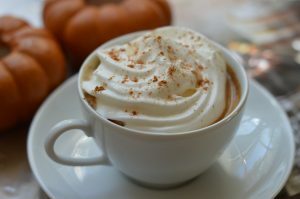 Recommendation: If you are afraid of extra calories but at the same time want to see lush foam in your cup, do easier – before adding coffee, whip the hot milk pumpkin mixture with a blender. According to the legend, this type of coffee was invented not so long ago, in 1997, in one of the Moscow coffee houses. One of the guests of the coffee house was Rafael or shortly Raf. He did not like coffee. To somehow please the capricious visitor, the barista thought up whipping coffee with cream and vanilla sugar for him. Soon “coffee as Raf has” began popular among his friends. Other visitors wanted to try the recipe as well. As a result, Raf coffee appeared in the official cafeteria menu. To make it, you need follow the recipe below. 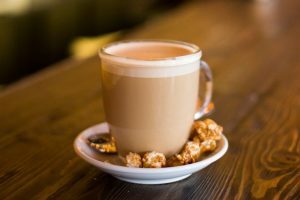 The point is that coffee and cream are beaten together with each other, rather than individually, as it is usually done. At home, it is difficult to do, but you will be able to prepare a drink that is close to the original. Mix 50 milliliters of newly cooked espresso with the cream warmed almost to a boil. Add sugar to taste and a few drops of vanilla extract. Recommendation: Whisk it with a whisk or use a blender until a delicate coffee creamy skin is obtained. In Turkey, coffee with garlic and honey is the most popular variant of making coffee. To cook it, you will need to follow the recipe below. Preparation: 3 tablespoons of honey are poured into the Turk, brought to a boil, removed from the fire, quickly cut into a large chunk of garlic, brought back to a boil, added 3 teaspoons of ground coffee, mixed and again brought to a boil. Only after this, you can pour honey with garlic and coffee 350 milliliters of boiling water, put on a plate, stir and wait for the appearance of the coffee cap. 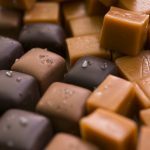 Recommendation: The main secret is that all the manipulations must be done quickly, only if you manage to do everything fast all the ingredients are going to combine in a single taste. 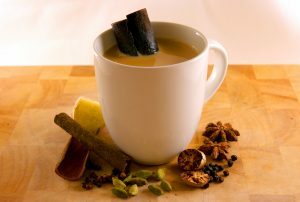 In the Caribbean coffee lovers prefer optimistic invigorating spices: orange peel, cinnamon, vanilla and cloves. 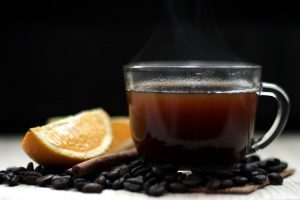 The coffee mixture is prepared for every 4 teaspoons of ground coffee – half a teaspoon of grated orange peel, a quarter teaspoon of cinnamon, half a teaspoon of vanilla sugar and 1-2 buds of ground cloves. Recommendation: Mix all the ingredients thoroughly and cook the drink in the way you are used to as in this recipe the main secret of unique taste is the composition and not the way of preparation. Hindus, for all their love for spicy, most often brew coffee with milk, somewhat softening the taste of the drink. Although, they do not forget about spices. So, to make coffee masala you need follow these instructions. One and a half of a cup of water is mixed with the same amount of milk and brought to a boil. Throw into the boiling liquid 3 tablespoons of sugar, the same amount of coffee, grains of 3 cardamom fruits and half of a cinnamon stick. Recommendation: Drink should be cooked in the smallest fire for about 3 minutes, stirring constantly. First, you have to cook a cup of your favorite coffee, while preparing it, add to it a teaspoon of cinnamon and half a teaspoon of nutmeg. Separately, mix two teaspoons of condensed milk with a teaspoon of cocoa powder. Pour half of the finished coffee into the cup, put cocoa mixture with milk in it and mix thoroughly. Recommendation: Dilute the remaining coffee and, if you wish sprinkle with ground almonds to add unique smell and taste. This recipe was invented back in 1901. It still remains the ideal option for the morning following the stormy feast. Cooking this drink can be with the addition of absinthe or champagne, depending on what kind of coffee you will use. Most often a combination of bitter coffee varieties with champagne is used. In a small amount of water, a pinch of vanilla is bred. Water is poured into the Turk. A teaspoon of coffee is dipped in a cup of diluted vanilla and immediately mixed with a spoonful of fine coffee. Then put the coffee to the Turk, mix and cook the drink on low heat until the formation of foam. At this point, add a tablespoon of semi-dry champagne and bring the coffee to readiness. An indicative can serve a grown coffee cap. 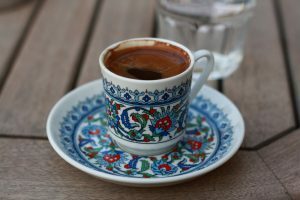 Recommendation: Coffee Oflameron is usually served in small cups. To prepare and serve Don Juan coffee, you will need a thick-walled glass. It is poured into a tablespoon of dark rum, the container is ignited and rotated so that the fire covers all the walls. After a few seconds, add a tablespoon of any coffee liquor and a cup of ready-made hot coffee into the glass. At the tip of the knife, cream is added neatly, so that it stays on the surface of the drink. Recommendation: Almost finished Don Juan is sprinkled with grated chocolate and served immediately. 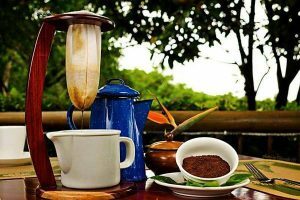 Oranges and rum – what else to dilute coffee in Jamaica with? Probably, this exotic recipe will taste to you. Especially great this recipe is because of its property to warm you quickly. Three glasses of ready coffee are mixed with three diced oranges and half a sliced lemon. The mixture is brought to a boil, add sugar to taste and pour three tablespoons of rum. The drink is ready! There is another variant of serving citrus coffee in Jamaica: orange and lemon zest are cut with a single spiral stripe and placed in a frying pan. To them you should add 6-8 tablespoons of sugar, 6 buds of a carnation, a teaspoon of cinnamon and a few spoons of brandy. The frying pan is heated until the sugar is completely dissolved, the peel is caught. Recommendation: The mixture is ignited and poured into a ready hot coffee with a thin trickle. For cooking white mocha, weld classic espresso or black coffee will be perfect. Cook in a pitcher 50 ml of hot chocolate and pour it into an air-glass. Warm up the milk and pour it into an air-glass with a bar spoon over hot chocolate. Over the milk pour in the coffee with a spoon to form layers. Recommendation: Decorate the white mocha with whipped cream and sprinkle with chocolate crumbs. 20 ml of coconut syrup. 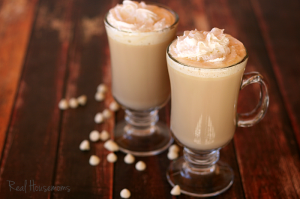 To prepare Kokochino, pour into a cup for coffee 20 ml of coconut syrup. Boil 30-40 ml of classic espresso or black coffee, and pour into a cup of syrup. Prepare the foam milk. To produce milk foam, you can use a coffee machine, a french press or a whisker for milk. The final stage in the preparation of Kokochino is the infusion of milk into coffee. With the help of light pitcher movements on the surface of coffee, you can form a variety of shapes. Recommendation: Serve it in cappuccino cups. 20 ml of liqueur Sambuca or Cointreau. 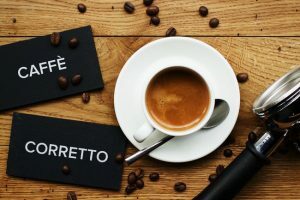 To make Coretto coffee, cook a standard serving of classic espresso or black coffee. Add the liquor to the cooked coffee. Recommendation: Serve it in cups for espresso. 15 ml of coconut syrup. To prepare a cocktail Pirate’s dream you should make a double espresso or black coffee. Pour the white rum into the Irish glass. Bring the lit match to the rum and set it on fire. While the rum still burns, pour into a glass of coconut syrup. Extinguish the flame by covering the Irish glass with a saucer and pour the top layer of coffee into it. Recommendation: Decorate the cocktail with whipped cream. Serve in Irish glasses. To make a coffee drink Nomado beat the blender with milk and ice cream until smooth. The resulting mixture is poured into an Irish glass. Boil a standard serving of classic espresso or black coffee and pour it into an air-glass until the layer is formed. Decorate the contents of the Irish glass with whipped cream. Recommendation: Top the cream with Bailey liquor. Pod of red pepper – decoration. Pour the ground coffee with red pepper in the French press for 4-5 minutes. In the glasses put 50 g of ice cream. Piquant combination of hot and cold, hot pepper and creamy sweet ice cream – the original balance, just emphasizing the taste of coffee! Recommendation: Pour the brewed coffee into the glasses. Decorate each glass with red pepper. Espresso does not have as much caffeine as in coffee, prepared in a “drip” way. Prepare “Espresso” quickly, letting water under strong pressure through ground grain. Since the contact of water and coffee decreases, the caffeine in the Espresso cup will be less. October 1 is the “Coffee Day” in Japan. This country ranks third in the world in terms of the amount of coffee consumed per person. The coffee contains about 800 aromatic compounds. Coffee takes the second position in the world ranking of the best-selling goods after oil. 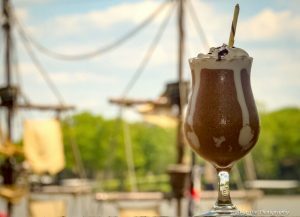 Coffee as a drink exists for more than 700 years. One cup of coffee is 300 antioxidants, which will stay in the body for a month. Caffeine enhances the effects of aspirin and paracetamol. After a cup of coffee, the acidity rises and the stomach takes and dissolves the pain relievers more readily. Coffeemakers are much less likely to visit a dentist. The elements contained in this drink do not allow bacteria to settle on the tooth enamel. Caffeine reduces appetite, accelerates the consumption of calories and metabolic processes in the body. 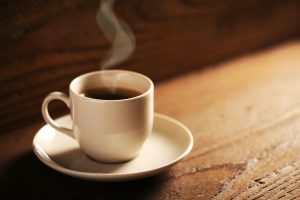 If you drink 6 cups of coffee a day, combining this with physical activity and a low-calorie diet, a slim figure is assured to you – because excess fat with regular coffee consumption burns up to 20% faster. In a cup of black coffee without sugar there are 0 calories. How to get rid of bad stains on clothes without the dry cleaners? ← How to get rid of bad stains on clothes without the dry cleaners?